No matter how much we prepare for the holidays, something usually slips through the cracks. And without fail, it goes unnoticed until the exact moment we need it. Avoid last-minute scrambles this year by stocking up on these essentials. 1). Brown kraft paper can be used for wrapping gifts, covering up the kids' (or adults') table, making place settings, as a table runner or for gift tags. 2). Colorful tape makes any wrapping job more fun. Stock up for birthdays while you're at it. 3). 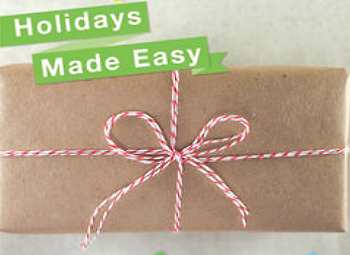 Twine in cheerful colors can be used for wrapping pretty presents and packages, tying tags, hanging decor and more. 4). A gold pen can be used to dress up brown kraft paper and colored gift tags or make a thank-you note look extra special. 5). Scissors. Consider buying a colorful pair for extra holiday cheer. 6). A hole punch and colored paper to make gift tags and confetti (at the same time!). 7). White twinkle lights can make any room look festive. Keep these on hand for quick decor. 8). Candles in all all shapes and sizes should be on hand. Stock up on scented candles for the bathrooms, decorative candles and votives for table settings, and Hanukkah candles for those eight special nights. 9). Matches should be ready for all those candles, a cozy fire and maybe a New Year's Eve sparkler or two. 10). Cloth napkins make even impromptu meals feel formal, and can take the wear and tear that comes with heavy holiday meals. 11). A serving tray will present your annual holiday cheese ball in style. 12). Tide pens will take care of those inevitable red wine and gravy spills. 13). A bottle opener. Don't be the host who has to run to the store 15 minutes before the midnight toast! 14). Coasters strategically placed on every table will encourage guests to protect your furniture. 15). DIY drink tags in holiday colors help your guest keep track of their glasses. Just trace the bottom of a wineglass on a piece of paper and trace a dime in the center. Cut both circles out with a slit between and use your gold pen to label each one. 16). A doormat in a bright color can help remind guests to wipe their shoes before coming in. 17). Thank-you cards. A handwritten note is a great way to show family and friends your appreciation. 18). Holiday stamps announce the arrival of a special invitation or note before the envelope has even been opened. 19). Cleaning supplies will take care of any pre- and post party messes. 20). Whether you're sore from late-night dancing or have a headache from too many Christmas carols, you'll want to keep a big bottle of ibuprofen around this holiday season.